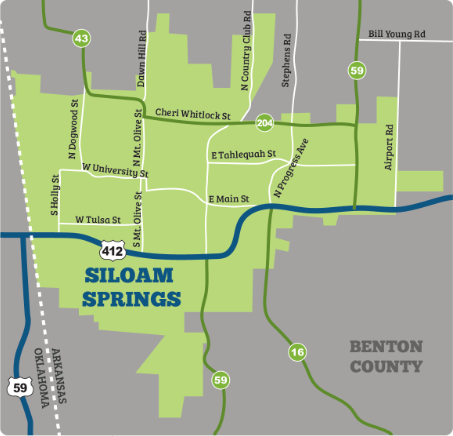 Siloam Springs, Arkansas is located on U.S. Highway 412 at the Oklahoma state line, only 25 minutes west of Interstate 49. U.S. Highway 412 at Siloam Springs is the number 1 non-Interstate entrance into the state of Arkansas, with daily averages of 27,000 cars per day, according to Arkansas State Highway and Transportation Department (AHTD). including Charlotte, NC, San Francisco and Los Angeles, CA, New York, and many more. Tulsa International Airport (TUL) one and a half hours from Siloam Springs, offers nonstop flights to 17 U.S. cities. 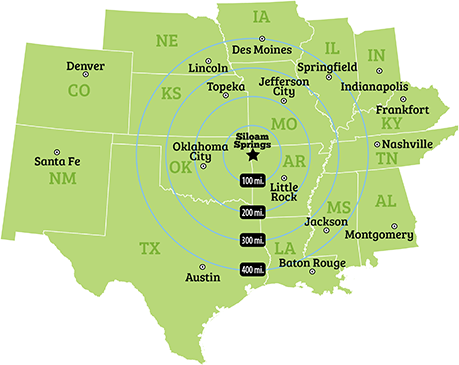 Located near the center of the U.S. population, several markets in the Midwest and South are within a half-day’s drive of Siloam Springs, including Kansas City, St. Louis, Dallas-Fort Worth, Memphis, Little Rock, Tulsa, Wichita and Oklahoma City. For personal or business trips, Cecil Smith Airfield/Siloam Springs Municipal Airport offers a paved runway of 4,999 feet which is able to accommodate a wide variety of jets as well as all sizes of piston engine aircraft.